Explain Several Concepts With a Single Activity. Earthquakes, volcanoes, plate tectonics, and map reading all get equal attention in this classroom project. Students work both as a class and individually plotting earthquakes and volcanic eruptions on a large world map and on their own student sized world map, then mark them with colored labels until a pattern forms. Using their knowledge of fault lines, quakes, and eruptions, students deduce where the “Ring of Fire” that outlines the Pacific Basin exists. 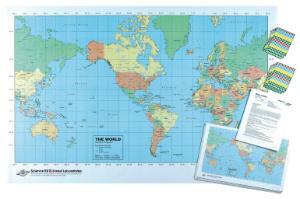 Includes a large (36 x 54") world map, a package of 30 student (11" x 17") maps, two packages of self-stick labels, teacher's guide, and instructions.